Some poets take the position that poetry must address the political and social issues of its time. Others believe political debate has no place in poetry. Most, even those who don’t write political poems themselves, agree that if a political matter is of personal importance to a particular poet, it is a valid topic for their poetry. 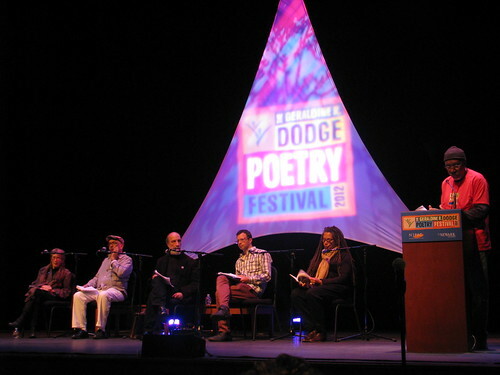 Festival Poets consider how and when poetry might/might not be called upon to bear witness. To paraphrase Juan Felipe Herrera, “Tenderness encouraging tenderness, making things that haven’t been said come to light.” If ever there was a panel that could bring about tears from sympathy and thumps of the heart drum from inspiration, this was it. The discussion was so enthralling, I completely forgot to take notes! The urgency behind Zurita’s reading in Spanish, the call to stop being polite in writing (literature having been defined as “polite writing”) to affect positively one’s local community, and to further that and take back the entire world. Large aspirations for such small groups words as poems, but the way the panelists spoke and read and bantered could be enough to sway any borderline heart to compassion (and hopefully action based upon that compassion). Don’t let me tell you how you should b affected. Listen* for yourself and get affected! Then maybe, if you think more discussions like this should take place, go donate a few bucks to the Foundation that made it possible. *This recording is not sanctioned by the Geraldine R. Dodge Poetry Festival or its associated Foundation and is solely offered in faith that 1) no-one reads this blog anyway, 2) it was for the benefit of poetry and those who appreciate poetry that the event took place, and 3) supposedly the Foundation’s own YouTube channel will soon offer coverage of this event anyhoo. In short: please don’t sue. Email me, and I will remove the link permanently as well as delete the files in question from their source.